This is the summer of Maggie Mather! This season’s totes and backpacks return to sport all new styles and colors. Not only are these iconic bags great for a day on the court, but will look organized and prepared with any outfit you put on. The Three Tone Tote and Tennis Tote , created in 2008, are pretty similar in design and style. Both are made out of heavy duty and water resistant fabric, which is perfect if you have kids or know that you’re going to be in a hectic – and potentially wet – environment. 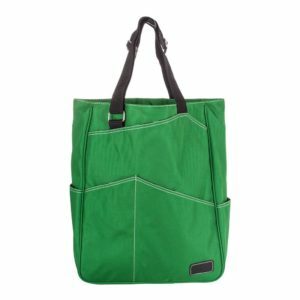 No need to fret about storage because both totes feature an exterior racquet pocket and additional front, side, back, and interior zipper pockets. The Tennis Tote now comes in Coral or Emerald, this bold and dramatic color combo is sure to stop traffic! 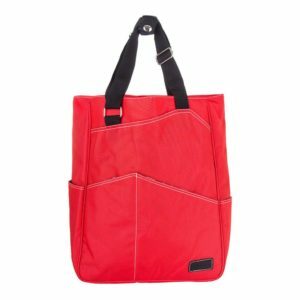 The Three Tone Tennis Tote (above) features an all new triad of colors: orange, red, and fuchsia. All are bright summer colors that show strength and excitement, and that can match easily with any game time outfit! Here are some collections with the same warm tones to match: Bolle’s Confetti, Lija’s Tropical Sunrise, and the New Balance Fall Collection! If you prefer backpacks so you’re hands free then look no further than the Sling Backpack. The durable nylon fabric exterior can last the roughness of the court and will last you many matches. If you can’t decide which of your two favorite racquets you want to use that day, bring both! The backpack features two front zippers that can hold up to two racquets. There is also plenty more room for your essentials with the interior zipper pocket, smaller accessory pocket, and a mesh pocket. The backpack now comes in Silver Dust, Electric Blue, and Khaki. I prefer the Silver Dust because of the neutral tone that it offers, making it perfect for any outfit or season of the year. However, you can’t go wrong with Khaki or Electric Blue. Feel confident and let that translate onto the court when you walk on with the latest Maggie Mather tennis bags from Tennis Express! Dare to share with us what you gear up with? Make a collage or tag us in your own gear guide video on Facebook, twitter, or Instagram and show us what your essentials are in your tennis bags! ← Venus Williams is in the Wimbledon Final!